For the last 2 decades, the influx of foreigners in Thailand has been on a steady rise making her a tourism hot spot and a land of economic opportunity both at the same time. Asians, Europeans and even people opposite of east continue their daily arrival in the kingdom. These waves of transiting humanity include those who are for the thrills and pleasure, but most of all those who seek fame and fortune. Time and time again, foreigners have not only reached the revered destinations of Thailand but also began infiltrating her bustling businesses and office spaces. It wont take a long time for the falangs to grow as numerous as the chillies down the markets of Bangkok. The spurts of foreigners coming in and the growing roles they play in the office alarmed the Thai government. Astringent measures to control their influx and limit their engagements in the business sector were made into laws and some bi-lateral agreements. However, things seemed a little-bit complicated as its always been for the Thais. For one, many falangs who come in as tourists practically use the opportunity to stay and work in the country. Most of them just exit back across the border and trot back in with their renewed stay. So much for the visa runs! Tourists are not allowed to work in Thailand. If they want to, they need to have their visa changed into a Non-Immigrant B Visa. This visa is typically the one issued to foreigners so they could engage in business or employment purposes inside Thailand. It comes on 90-day single entry, or on 1-year multiple entry. They could apply for this visa in the Thai embassy/consulate in their country of origin, or if it should happen that they are in Thailand already, they can apply for the visa in the immigration department. Another important document is the Work Permit. The Work Permit is the document that determines a foreign employee’s nature of work, length of employment, and some of his basic information like who’s he working for or where is he staying at. (See Siam Legal’s Work Permit Application page here.) Practically, a falang (even if he is a non-immigrant B visa holder) is prohibited to work in Thailand without this document. In order to apply for a work permit, one must already be in possession of a non-immigrant B visa. And like a visa, a work permit is also extendable as much as cancellable on certain conditions. The Thai government categorized jobs to determine which are ok and which are not for foreigners who wanted to work inside the country. They worry that foreigners will grab the jobs away from the locals, and so they deemed some jobs as exclusive for the thai people only. On the other hand, foreigners are allowed to engage in export, wholesale trading not mentioned in cat. a and b, retailing of machinery, equipment, tools, manufacturing of animal feeds, textiles, glass wares and ceramics. Selling commodities that promotes Thai tourism is also allowable. When applying for a work permit, make it sure that the job description you are putting up is not considered prohibited, else you wont get to see your work permit anytime soon. The checklist for the foreign worker does not end on the prohibited types of work. In fact, it only begins upon obtaining the work permit. 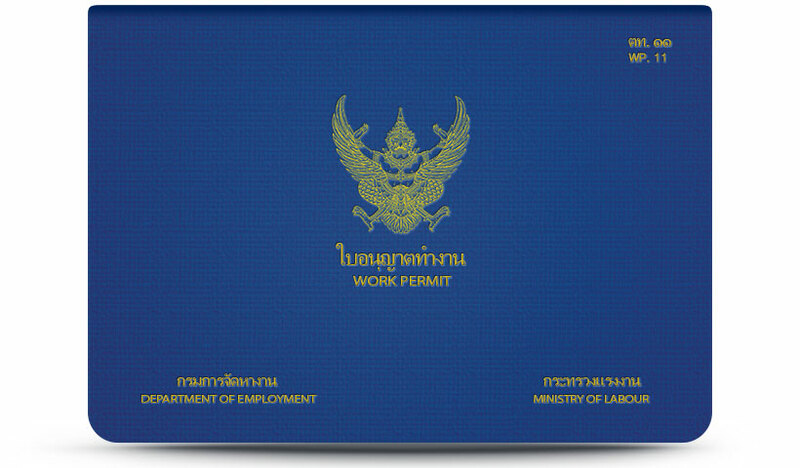 The Work Permit is a thin booklet purposely made to be carried by its owner. The falang should keep the booklet with him at all times, especially at work. He/she should perform the work as stated in the work permit, and in no circumstances he/she should perform other functions besides the one declared on the document. In the event of changing address, he/she must apply for revisions. If the work permit is lost or damaged, he/she must report it to the labor department immediately. The document would be replaced by a new one. Most of all, upon resignation of work the document should be returned to the labor department within 7 days. It is very important to note that failure to act on any of the regulations mentioned above is punishable by fines, or worst, detention and imprisonment. Thai authorities are very strict when it comes to violations and the law in general. Trust me, you don’t want to be on the receiving end. After all, nobody has been at loss by just following simple guidelines & regulations in a country where the west meets the east.